This page has been revised with the most recent events listed first. The following is a list of the 2001 events I have attended or participated-in with the 2001 artifacts. 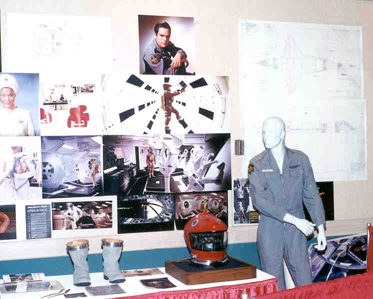 In response to a request from the Kubrick Estate and the Filmmuseum, I sent the red 2001 helmet to the exhibit, along with a reproduction HAL panel. I decided to attend the opening of the exhibit which was scheduled for 30 March, with a Preview on the previous day. The public opening was scheduled for 31 March, so I decided to arrive on 28 March and depart on 1 April. I met up with Scott Alexander, who was there to assist with hanging of one of his eleven foot Discovery models. Seeing his model up close is breathtaking. The Discovery is beautifully made and painted. The Discovery was suspended just off of the main lobby of the Filmmuseum in a wide open area over a steep wide descending staircase which leads to the theater and Architektur Museum. It provides a dramatic entry to the exhibit. Scott and I spent the first couple of days prior to the Preview exploring the Exhibit, which was still undergoing final preparations in some areas, and taking some pictures. Here are some images from my visit. 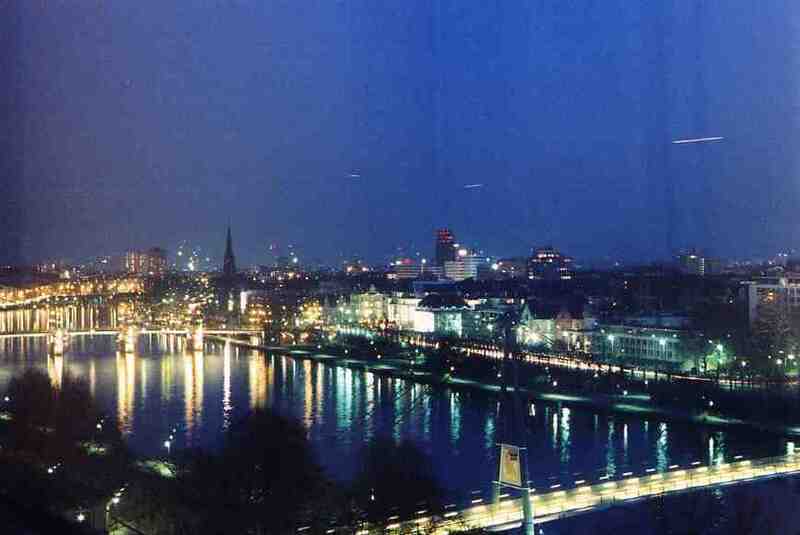 Frankfurt as seen from my hotel room. 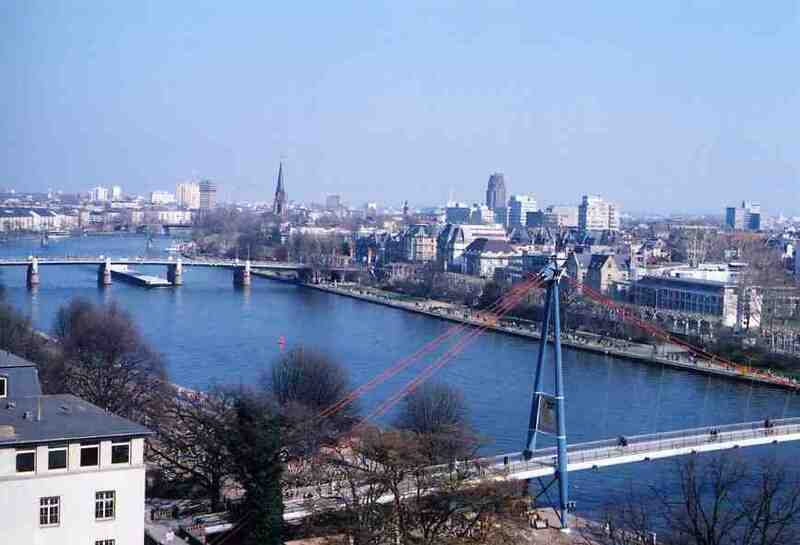 The Main river runs through Frankfurt. These images are daytime and nighttime views looking southeast toward the Filmmuseum. 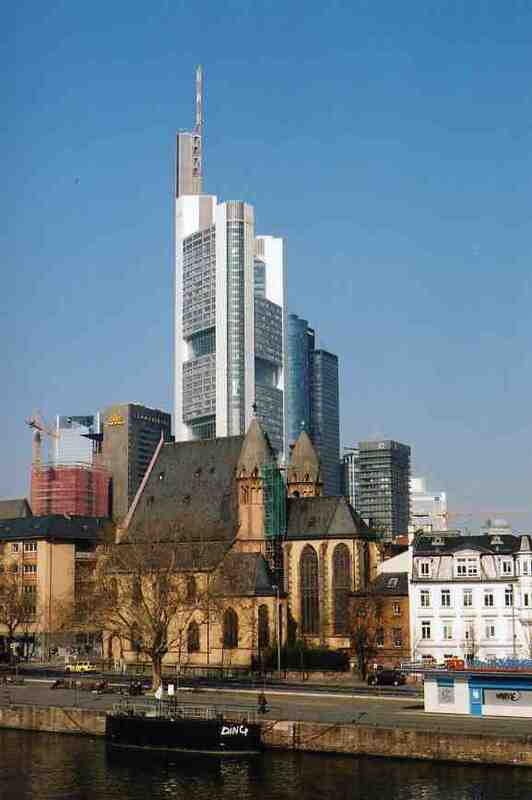 Frankfurt is the financial center of Germany, and so in some respects resembles the skyline of Manhattan, New York. However, much of the old city remains, so that the city is a mixture of old medieval style buildings with modern skyscrapers towering above them. 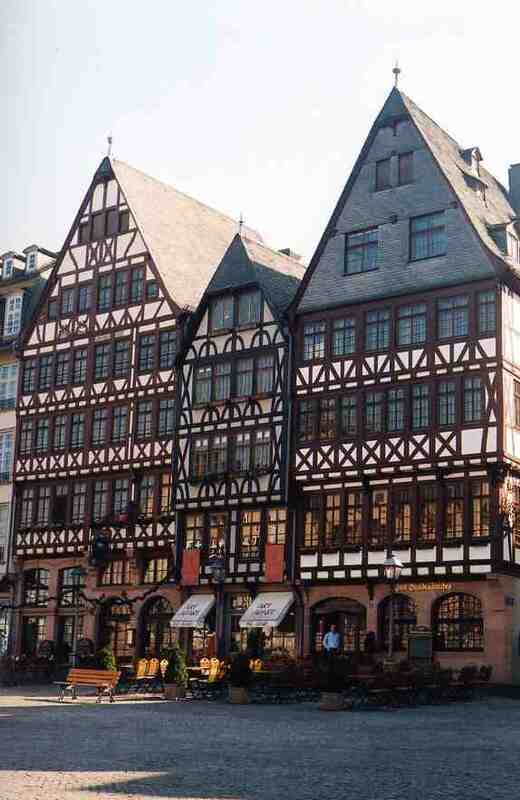 These buildings flank the beautiful old town square of Frankfurt. A great place to sit and have lunch or dinner with friends. The Kubrick Exhibit was housed in two museums, which are adjacent to one another along the Main River. Below are some images of the museums. 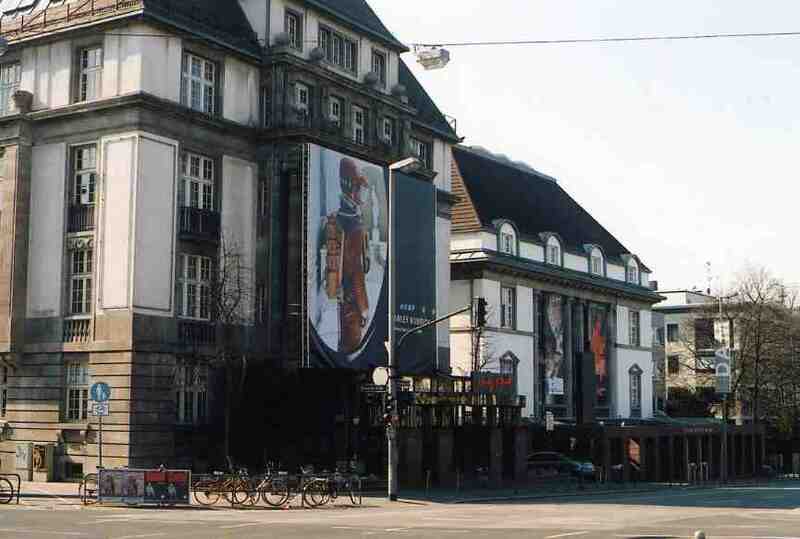 The Deutsches Filmmuseum is on the left with the Deutsches Architektur Museum on the right. 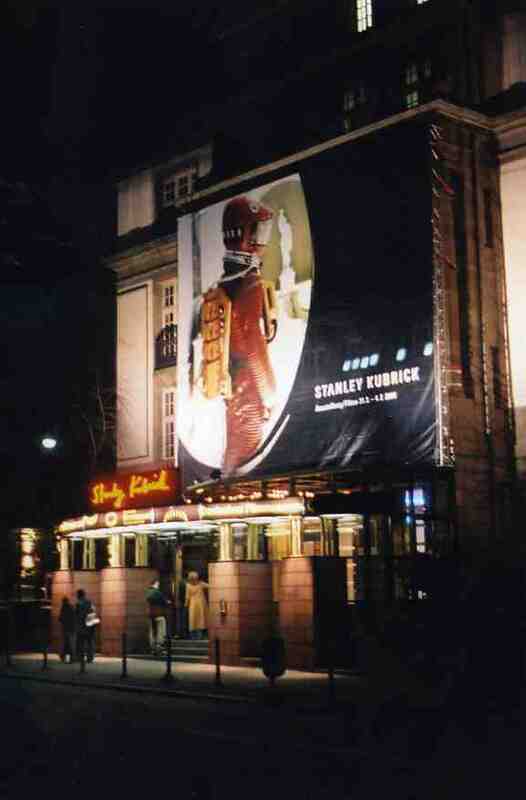 The Kubrick exhibit occupied both buildings, and covered all of his career, both as a photographer and film maker. 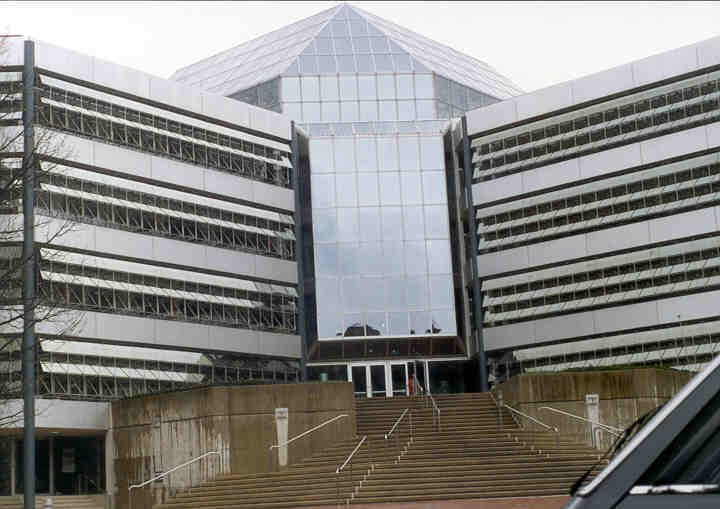 Large canvas images are displayed on the fronts of the buildings. The canvas on the left is a large reproduction of the exhibit advertising poster, which has an image of Bowman in the hotel room as seen through the pod window. 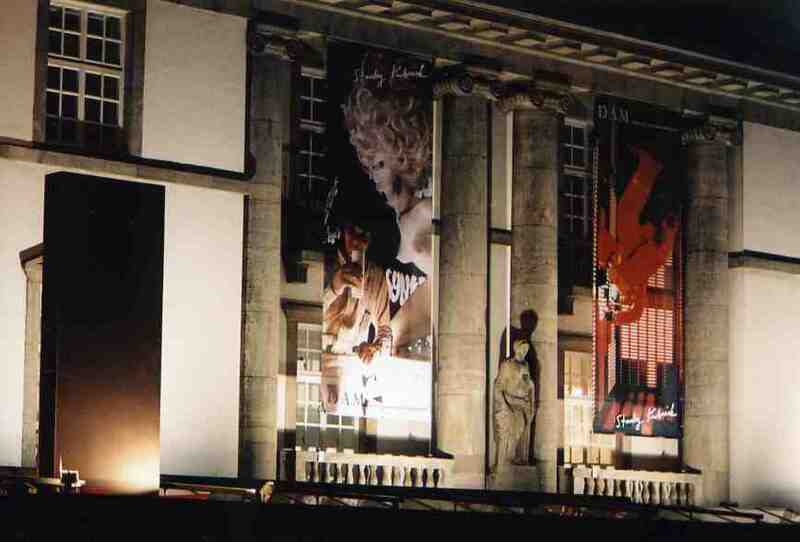 This is a night time picture of the front of the Filmmuseum showing the large canvas image. Note the "Stanley Kubrick" signature in Neon above the museum lobby entrance. This is a night time picture of the two canvas images on the Architektur museum . They are images from "A Clockwork Orange" and "2001". 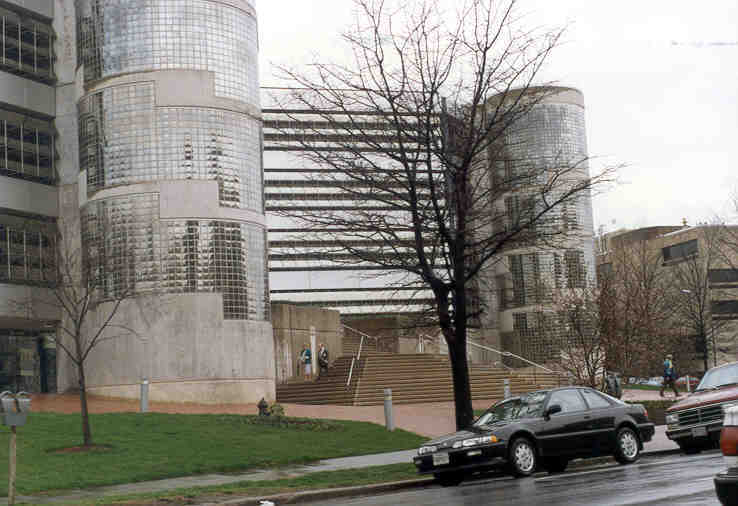 Notice the full size monolith (on the left) mounted on the lower roof of the museum. The Preview of the Exhibit took place on Monday evening, beginning with a short film summary on Stanley Kubrick, followed by discussions by Hans-Peter Reichmann (Chief Curator), Jan Harlan (Kubrick's brother-in law and Executor of the Estate), and by Christiane Kubrick. Museum Chief Curator Hans-Peter Reichmann , left, and Jan Harlan talk at the Exhibit Preview. A walk through of the exhibit followed with food and drink being served. It was a very enjoyable Preview of the Exhibit. Most of the following day (Tuesday) was for the Press, with the official opening party Tuesday evening. I spent the day examoing the exhibit and taking some pictures. The Official Opening Party was held on the dinner boat Nautilus. There was a huge crowd for the opening party. The Nautilus and both Museums were filled with people. There were so many people on the boat, it was standing room only. The Exhibit opened to the Public on Wed March 31. The exhibit covers all Stanley Kubrick's work, including the projects that were researched but never filmed, such as Napoleon and Aryan Papers. Regarding 2001, there are interesting artwork and concept sketches, previously unseen images, and rare artifacts on display. The exhibit includes color story board paintings of the lunar bus landing with the retro rockets blazing, concept sketches of costumes, images of unseen spacecraft models, and original artwork for the HAL monitor screens. The exhibit covers the use of Djinn furniture and discusses tie-ins with commercial companies. This topic is covered in the exhibit catalog, but the exhibit has the actual Hamilton watch used in the film. One display case contains the Oscar the film received for Outstanding Visual Effects, while another display case contains a silver spacesuit. There are also many color images from the film, that were either cut, not used, or were behind-the-scenes images, and have not been seen before. One such image is of spacesuited Bowman examining a robe which is laying on the bed. Another is of spacesuited Bowman sitting on the edge of the bathtub pondering his situation. There are many other equally interesting images in the Exhibit. The complete "Moonwatcher" australopithecus costume worn by Dan Richter is on display along with his notes and sketches from the production on how the man-ape actors should move and behave. The costume is so well made that, even up close, it looks real. I was also very amazed to see the original Starchild, still in very good condition. In another room a front projection rig, similar to what was used to film the Dawn of Man sequences at the watering hole, is set-up and operating with one of the original 2001 projection transparencies. The highlight of the event for myself was meeting Christiane Kubrick, and daughter Katharina Kubrick. Both very nice people with many interesting stories to tell. I spent my last day in Frankfurt viewing the the entire exhibit using the prerecorded narration player the museum provides. The exhibit is very well done. I left with a much deeper appreciation of all of Kubrick's work. If it is at all possible to sum him up with one word, that word is "Genius". This is a high quality exhibit, very well done. It is obvious that much time and effort went into putting this exhibit together. The Kubrick Estate as well as the Staff from the Filmmuseum and Architektur Museum should be thanked for making this exhibit a reality. In addition, Warner Brothers played a very important role in the exhibit, for without their permission, as "right holders" to the films, the exhibit could not have happened. 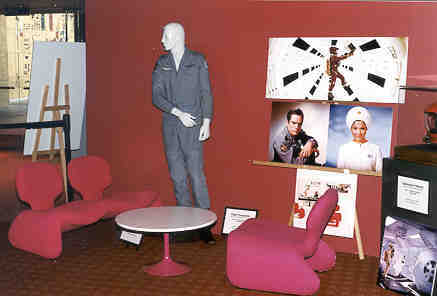 Warner Brothers also provided some rare props for the exhibit. It is planned, that this exhibit will be picked up by other museums for presentation in different cities around the world. However, as of this writing, this event is only scheduled for Europe. Hopefully, as word spreads, other museums elsewhere, including in the USA, will want this exhibit. An exhibit catalog is available from the Deutsches Filmmuseum via their website. The German version is currently available, and the English one will be published shortly. There are many unique pictures and sketches presented in the catalog. The catalog is well done, and is written as several studies on Kubrick's work, instead of a pictorial representation of the exhibit as seen by an exhibit viewer. Picture taking in the exhibit is not permitted, as cameras are not allowed in the exhibit hall. So the only way to see the rare, behind-the-scene, artifacts is to visit the exhibit in person. Therefore I strongly recommend visiting the exhibit. 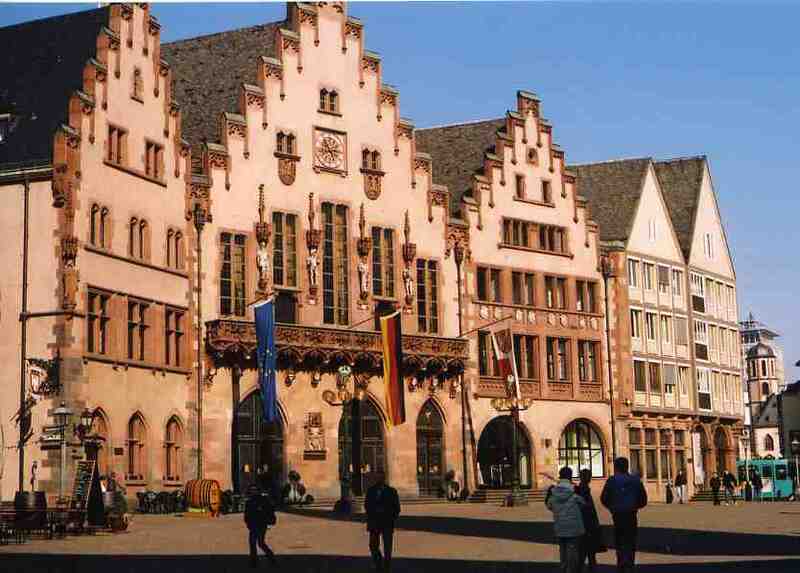 It will be worth the cost of the airfare to Frankfurt. I am very glad I attended the Exhibit. The Egyptian Theater held a special 2 week engagement of the remastered 70mm print in Los Angeles from 20 December 2001 to January 2 2002. 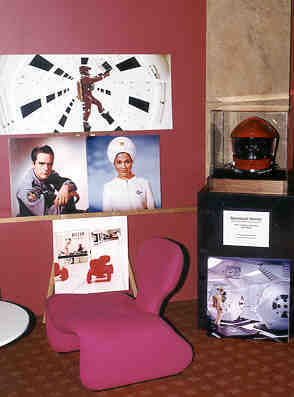 In conjunction with Larry Evans of the Orange County Space Society, several 2001 related exhibits were set up in the lobby of the Egyptian theater. 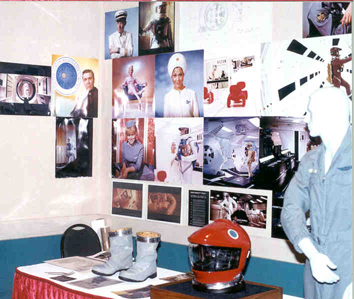 I set up a exhibit with the red helmet, Bowman's flight coveralls, Djinn furniture, and some image graphics from the film. What a way to end 2001, by seeing the last screening of 2001 on Dec 31 2001. ( I regret not going to the BFI 2001 screening event in London which opened the year with 2001, but at least I closed out the first year of the 21st Century with it). 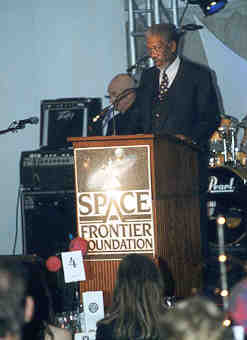 Morgan Freeman discussed his "Rendovous with Rama" project. 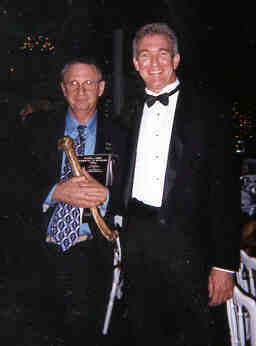 Dan Richter (left) who developed and played the character of Moonwatcher is one of the most gracious people I have met. He has many unique and interesting stories of his experiences with filming 2001. 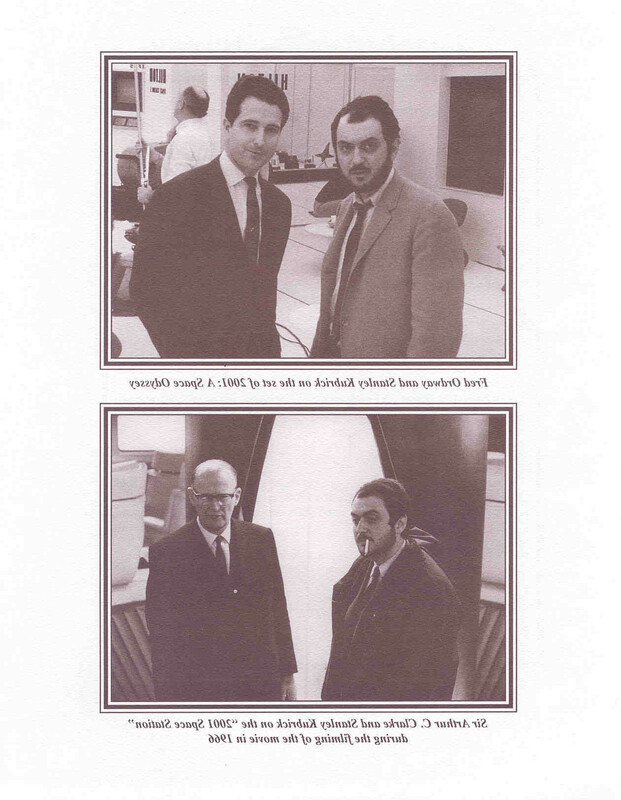 Dan has captured these experiences in his book "Moonwatcher's Memoir - Diary of 2001: A Space Odyssey". And Yes, that is a bone he is holding. 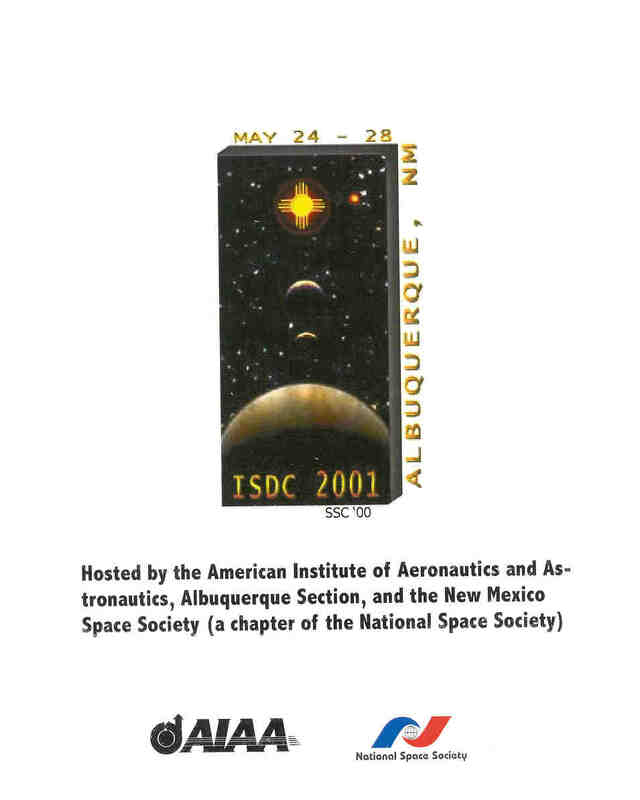 The International Space Development Conference for 2001 was held in Albuquerque New Mexico from 24 to 28 May 2001. 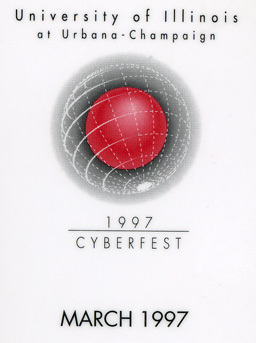 The theme for the event was, of course, "2001". 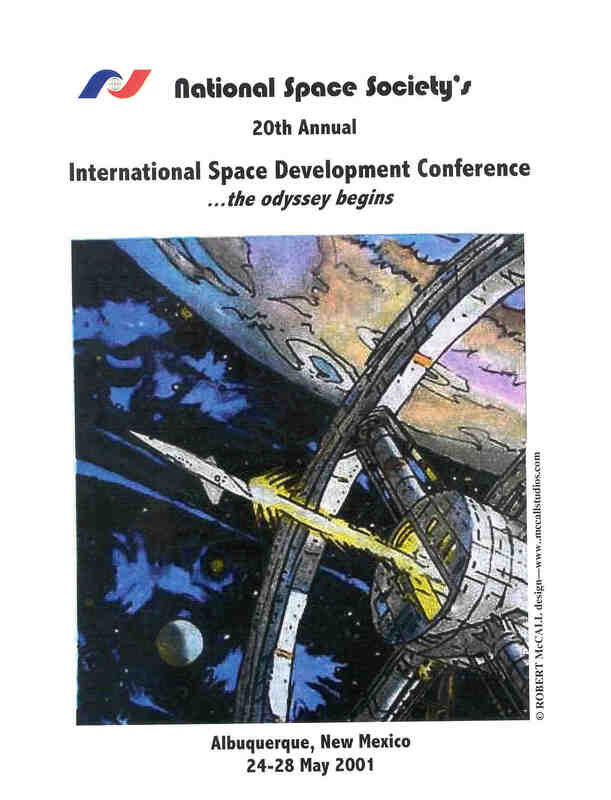 Key "2001" participants in the ISDC event were Keir Dullea (Bowman), Dan Richter (Moonwatcher), Fred Ordway (Technical Advisor), and Robert McCall (Artist). During a dinner, they recalled their experiences during the making of the film. This turned out to be the best 2001 related event in 2001. This is the 2001 artifact exhibit I set up in the Exhibit Hall at the ISDC event. 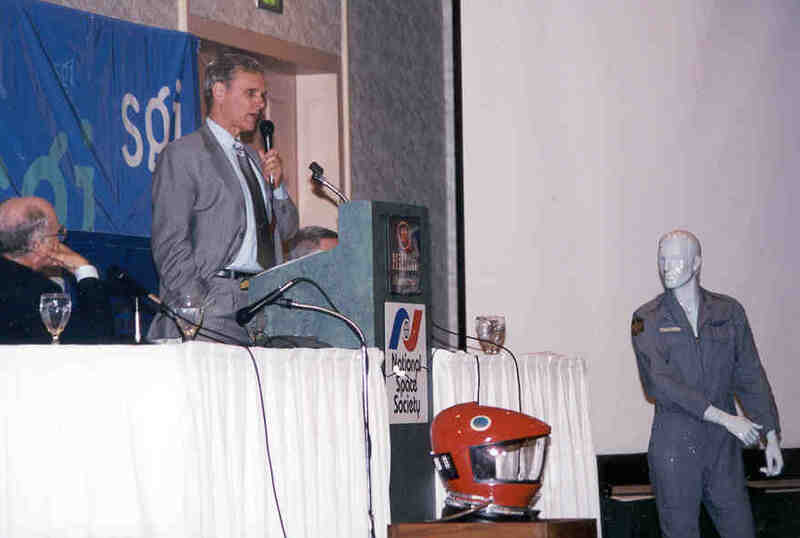 2001 artifacts included the red helmet, Bowman's flight coveralls, and Poole's spacesuit boots. The background was a collage of images from the film printed in large format along with a couple of 1965 blueprints of the Orion space plane model. 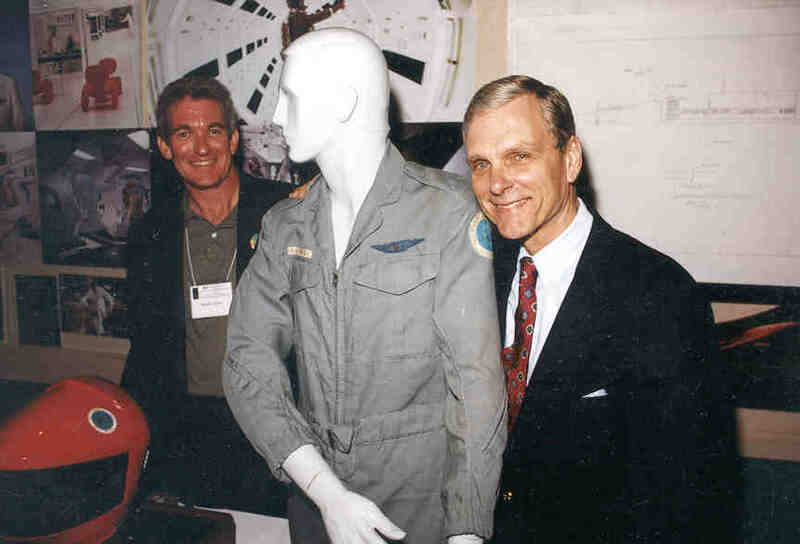 Keir Dullea posing with the artifacts. 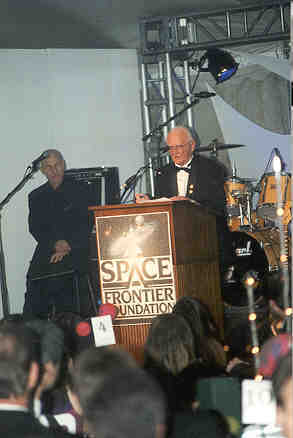 A gathering of friends, Keir Dullea, Fred Ordway, and Robert McCall. Flanking the three are Keir's wife and Bob's Daughter. A Dinner lecture and panel discussion on the making of the film was chaired by Fred Ordway. 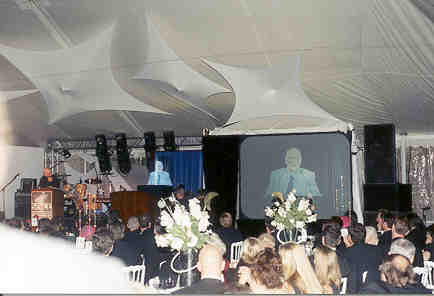 A film on the making of 2001 was shown. 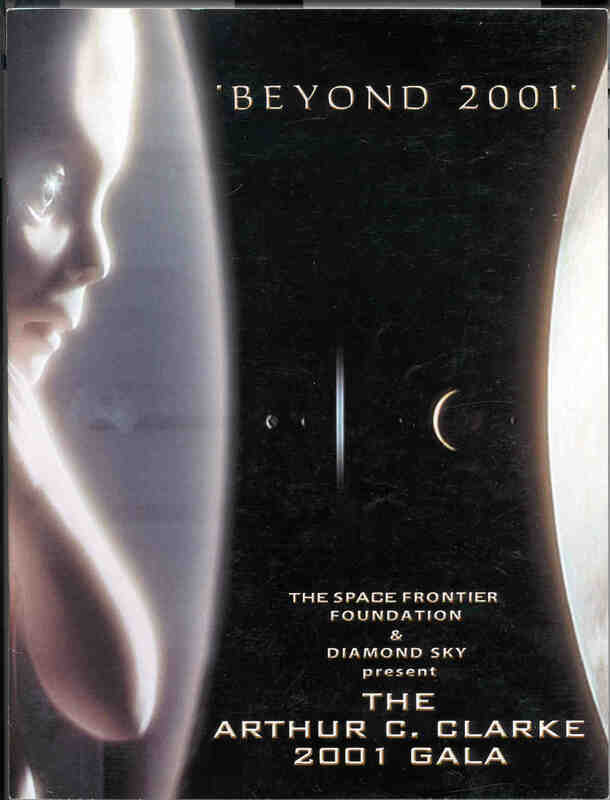 The event concluded with a screening of 2001. 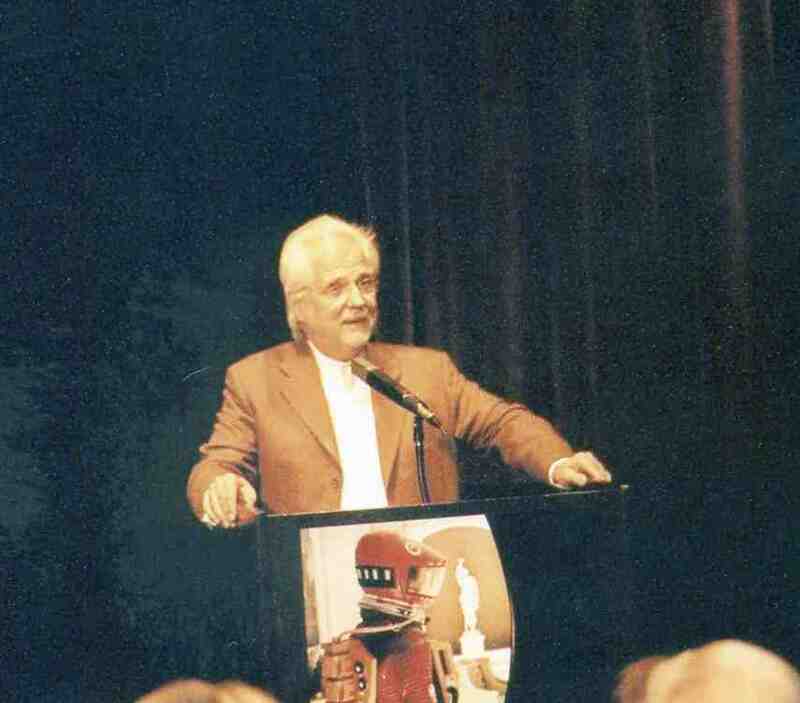 Fred Ordway (2001 Technical Advisor) discussed the technical aspects and problems encountered in making the film. 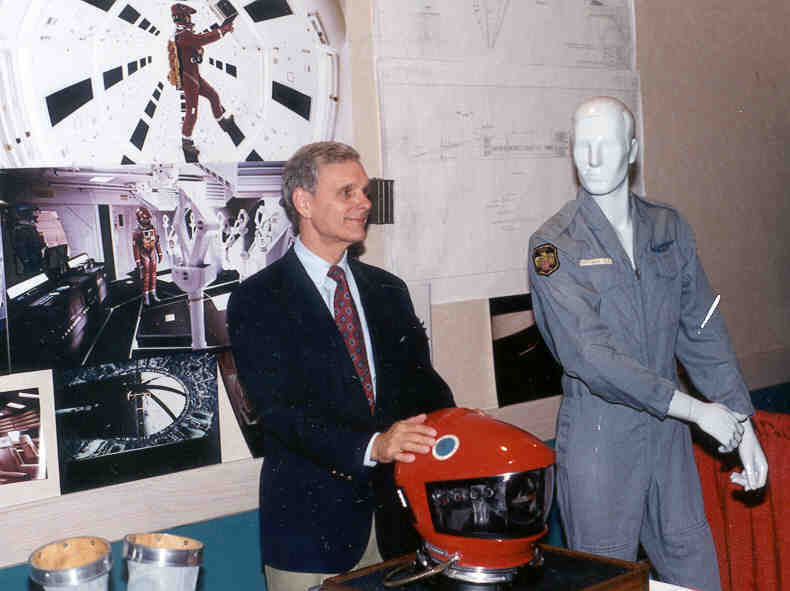 Keir Dullea told about his experiences of being dropped head first into the air lock during the explosive decompression scene. Dan Richter told of his experiences in developing the Man-ape mannerisms which made the man-apes (Australopithicans) seem so real. Bob McCall discussed his work in creating the famous artwork for the film. Four images were done in total, the Space Station, Clavius Base, Inside the Centrifuge, and Discovery with the Pod at Jupiter. 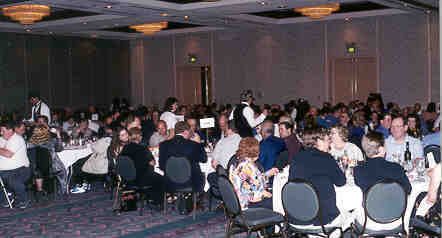 The 2001 Dinner event was attended by a sold-out audience. 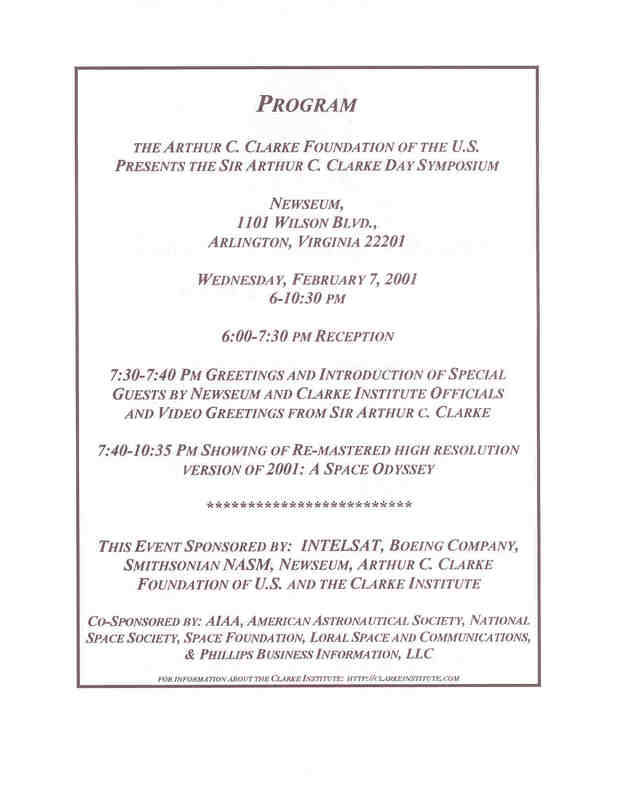 An event was held at the National Air and Space Museum in Washington DC to honor Arthur C Clarke. Martin Collins, Curator of the National Air & Space Museum opened the event and welcomed everyone to the Museum. Dr. John McLucas Chairman of the Arthur C. Clarke Foundation of the United States discussed the Foundation, with Conny Kullman, CEO of Intelsat performing as Master of Ceremonies. 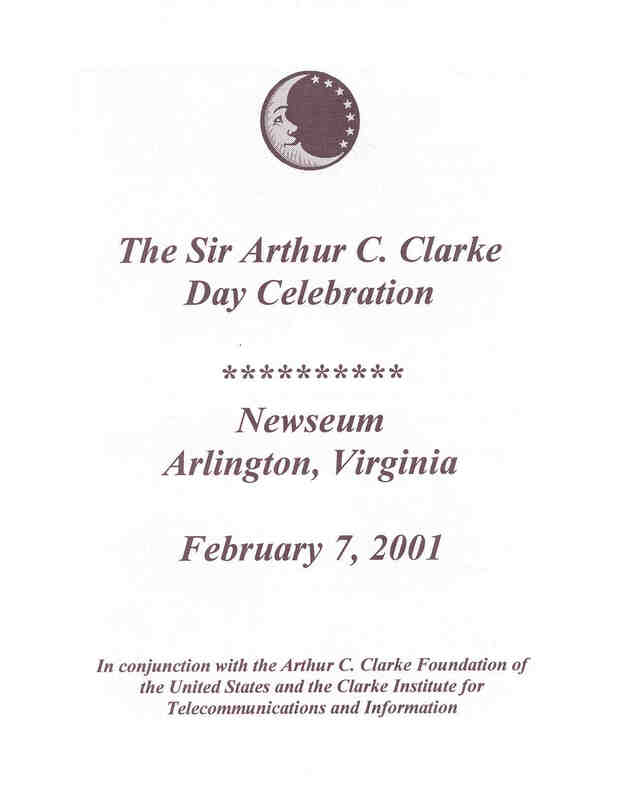 Video Greetings from Sir Arthur Clarke and Walter Cronkite were presented. 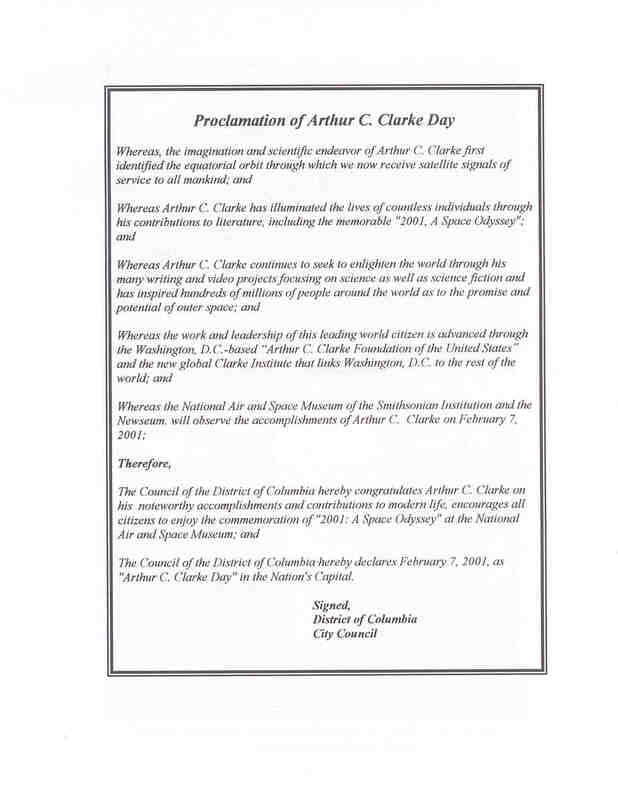 The day was proclaimed as "Arthur C. Clarke Day" in the Nation's Capital by the Honorable Jack Evans of the City Council of the District of Columbia. Symposium discussions with Fred Ordway, Fred Clarke, Keir Dullea, Marvin Minsky, Lt. Gen. Spence Armstrong, and Andrew Chaikin, followed in the NASM theater. 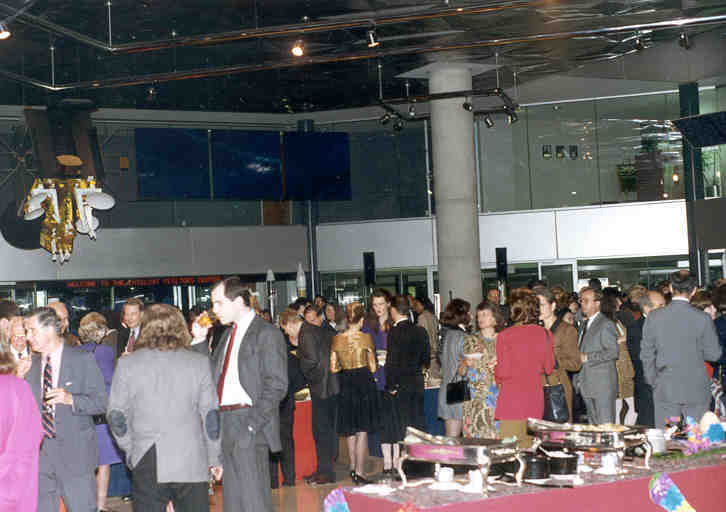 A reception and screening of 2001 followed at the Newseum in Arlington VA. The American Film Institute held a panel discussion on the film , hosted by Andy Chakin (A Man on the Moon). Discussion panel members included Keir Dullea, Gary Lockwood, Apollo Astronaut Bill Anders, renown actor Tom Hanks, and David Stork (HAL's Legacy). The chemistry between the panel members made this a very lively and enjoyable event. Afterwards I had the extreme pleasure of meeting Keir Dullea. 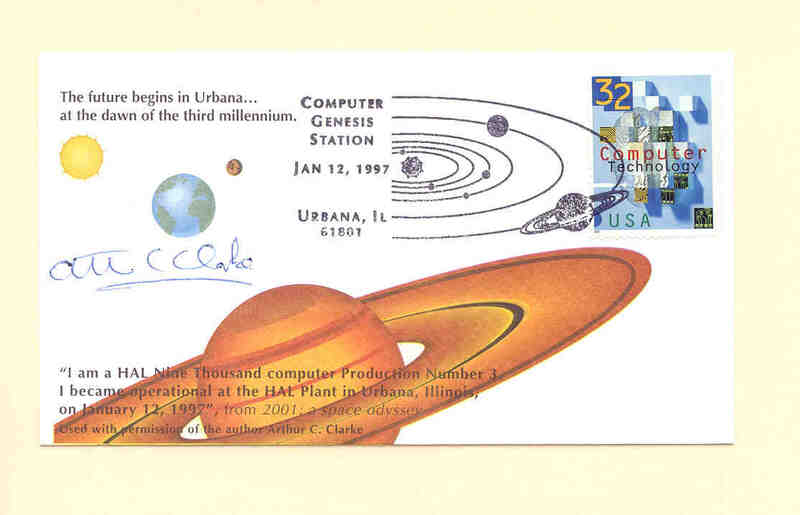 This event was held at the University of Champaign-Urbana (HAL's birthplace) to celebrate HAL's birthday. The event was held in March, although HAL's birthday was in January because its too cold there in January. The event consisted of a week long series of symposium lectures and demonstrations about machine intelligence. 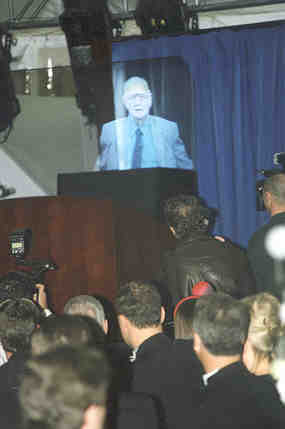 Key participants were Harry Lange (2001 set designer) and Piers Bizony (2001 Filming the Future). Harry gave a lecture on designing the sets for the film. 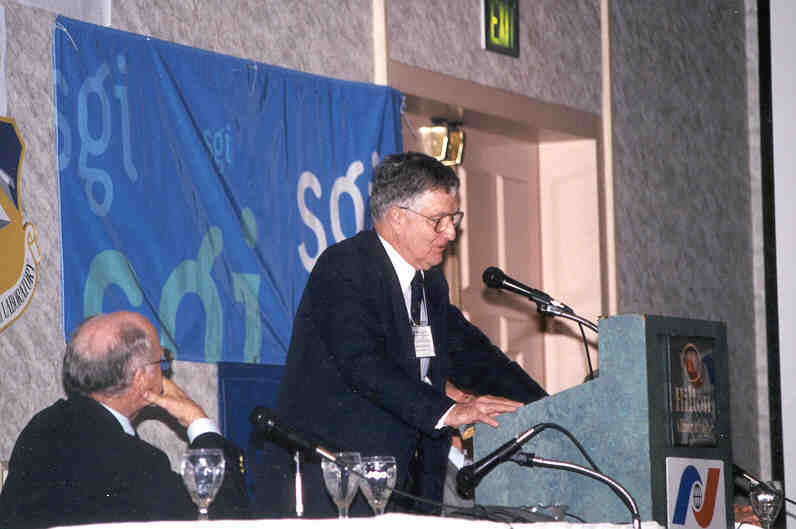 Fred Ordway (2001 scientific advisor) who was not able to attend, sent a documentary of the making of the film. During one of the side lectures by Harry lange on set design, I was fortunate to finally meet Phil Vendy, master of the Underview web site. His site is the best 2001 reference on the web (see Links). 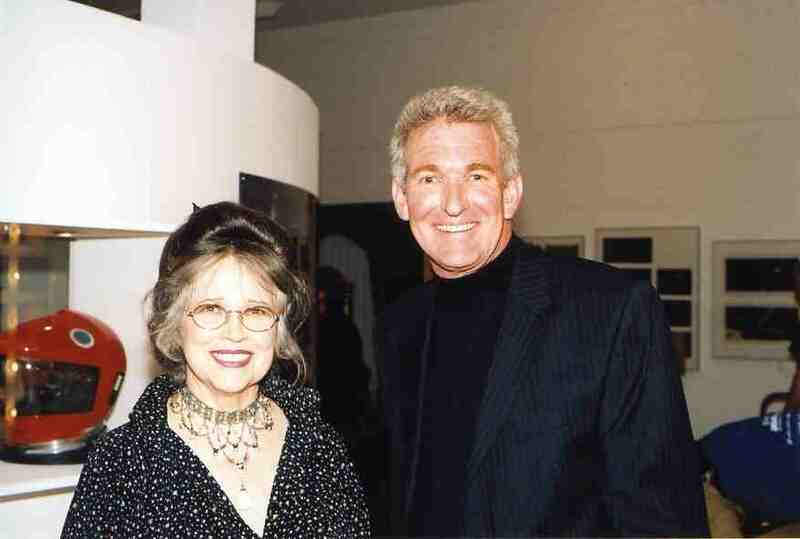 The event concluded with a special Birthday Party for HAL, hosted by renown film critic Roger Ebert. Participating in the event were Gary Lockwood, Harry Lange, Keir Dullea via video, Doug Trumbull via video, Piers Bizony, David Stork (HAL's Legacy), and Tom Hanks via video. Following the party there was a special showing of a 70mm print at the magnificently restored Virgina Theater, again hosted by Roger Ebert. This was a very enjoyable event. Held at the US Space and Rocket Center in Huntsville Alabama. 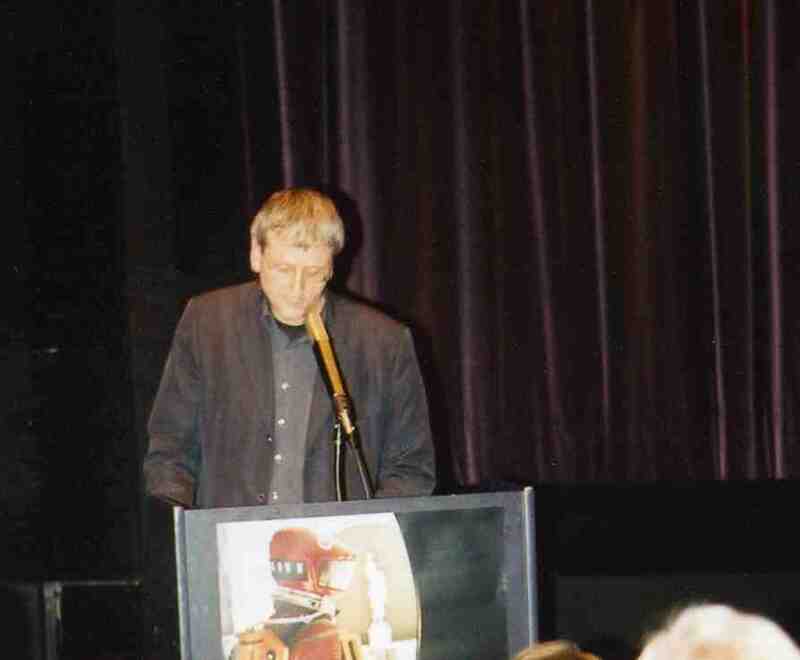 The American Film Institute held a Celebration for the 25th anniversary of the release of 2001: A Space Odyssey in conjunction with the 20th anniversary of The Film Club. 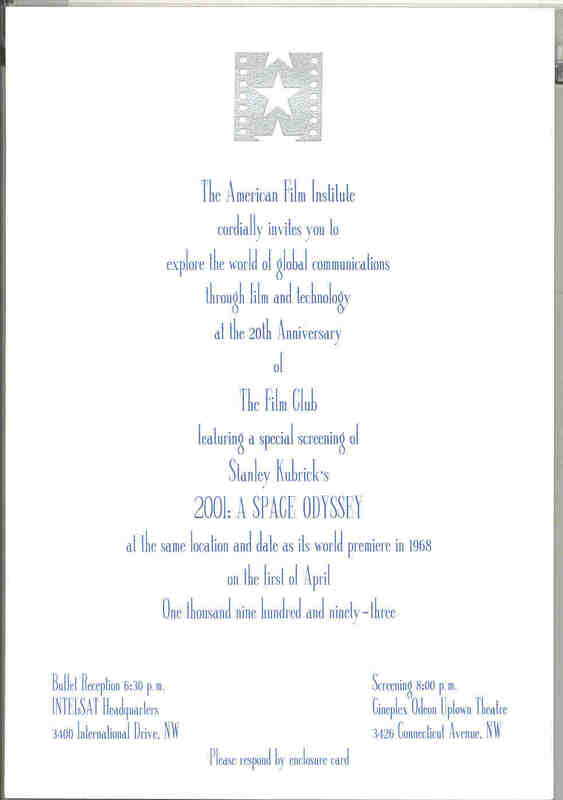 The event, where I had the pleasure of meeting Fred Ordway, Technical Advisor for 2001, consisted of a reception held at the futuristic Intellsat facility, followed by a 70mm screening of the film at the Uptown Theater in Washington DC. 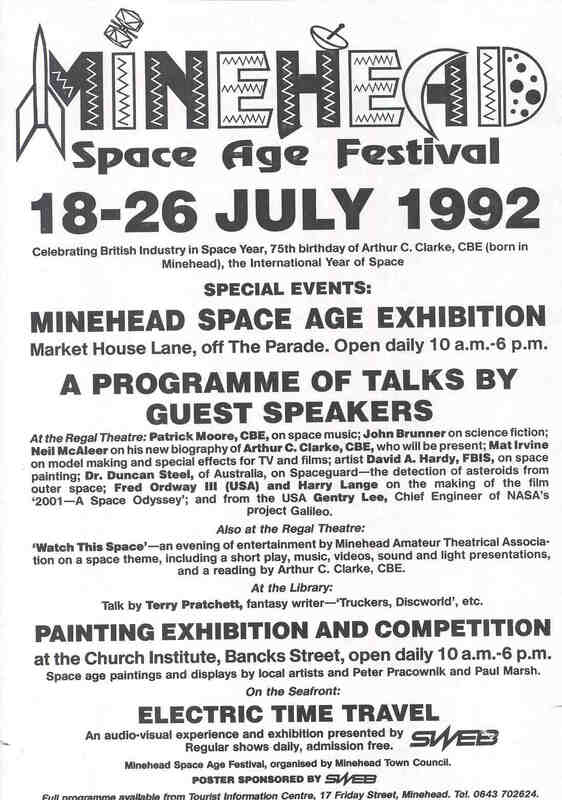 The Festival was held in Minehead, Somerset England, birthplace of Arthur C. Clarke, to celebrate Clarke's 75th birthday, the British Industry in Space Year, and the International Year of Space. Piers Bizony, who was working on his book "2001, Filming the Future" at the time, invited me to the event, and insisted I bring the red helmet. 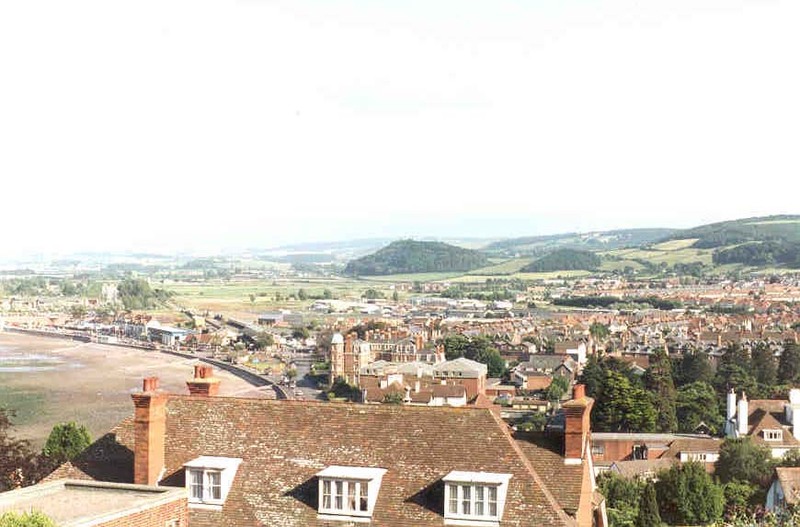 Minehead is a quaint resort town in south western England. This was my first trip to England, and I found the Somerset countryside to very beautiful. While there, I had the extreme pleasure of meeting Arthur Clarke, which is one of those events which I will remember the rest of my life. By any words, he is simply brilliant. I also had the pleasure of meeting Harry Lange and his lovely wife Daisy. 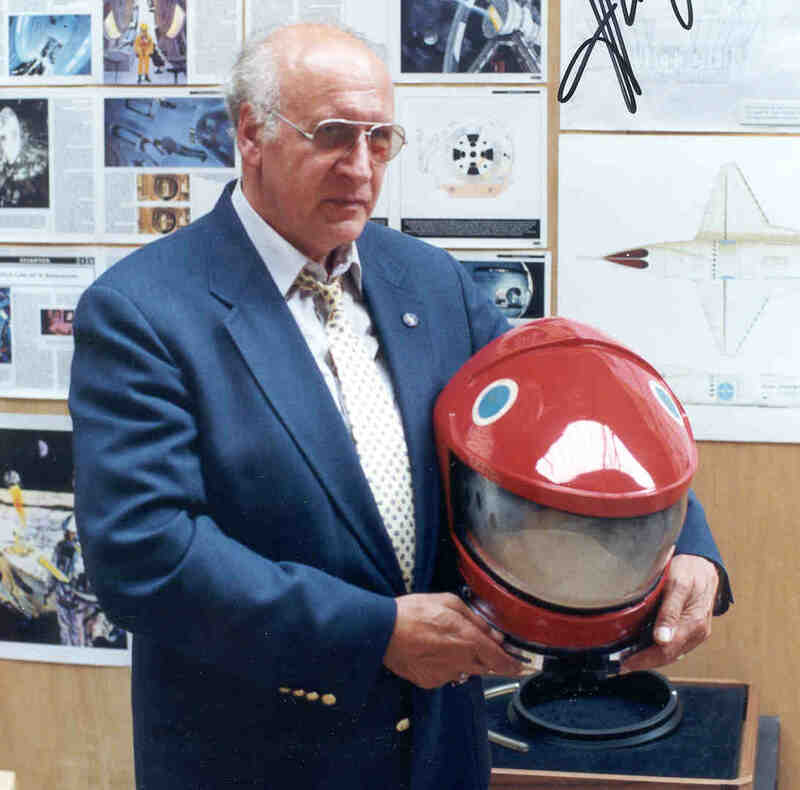 Harry designed the spacesuits as well as the spacecraft for 2001. Harry is one of those individuals who you enjoy being around, extremely talented, very artistic, and knowledge on any subject. Another very talented individual I had the pleasure of meeting was Mat Irvine, one of the most experienced and creative model makers in the industry. I enjoyed meeting Neal McAleer, who was working on his biography of Clarke at the time, "Arthur C. Clarke: The Authorized Biography". I also had the pleasure of meeting Capt. Carl Fismer of the Spanish Main Treasure Co. Carl is a Treasure Hunter and does the kind of things most of us dream about doing. Arthur Clarke and Carl dove together on the wreck of the Taj Mahal. (See Links). This was a very memorable trip. 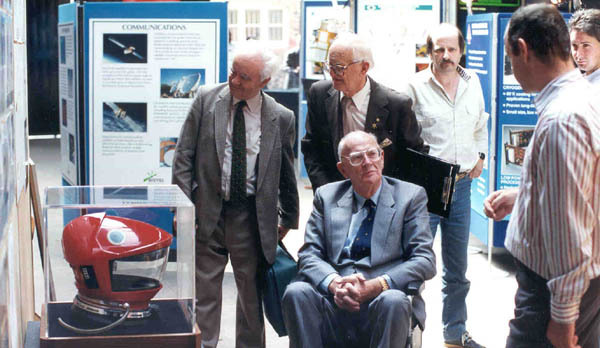 Arthur Clarke visiting the Exhibit area of the Minehead SpaceAge Festival. Here he is discussing the "Filming the Future" project with author Piers Bizony (at left). 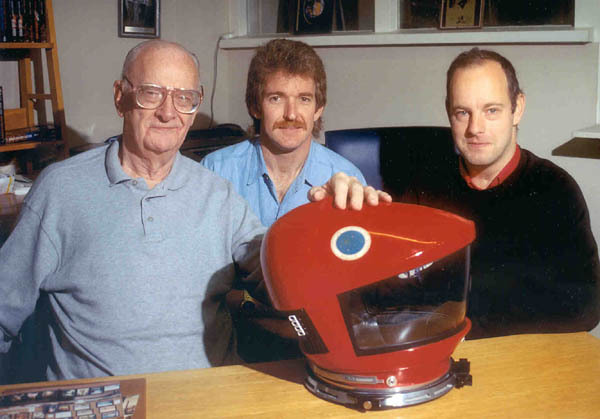 Sir Arthur Clarke with Bowman's red helmet. 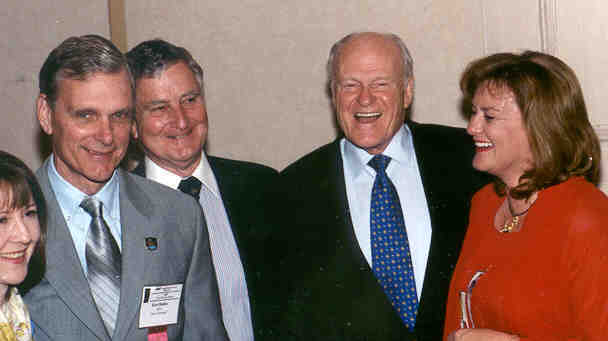 Piers Bizony (2001: Filming the Future) is at right. 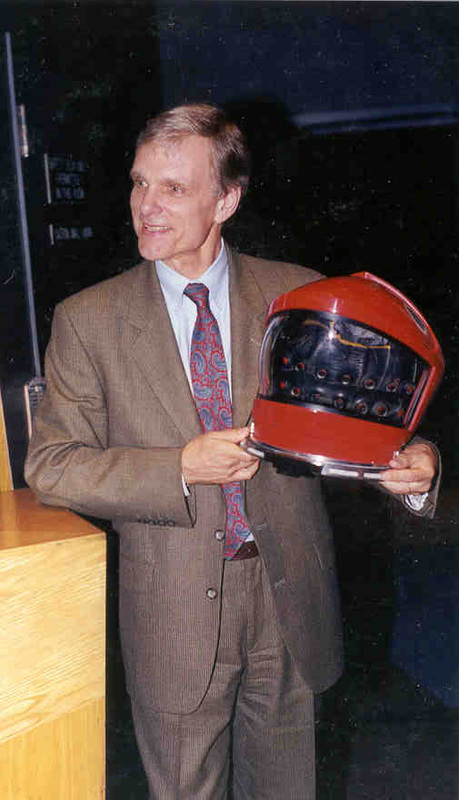 Harry Lange holds the helmet he designed 26 years earlier. A screening of the flim was held one evening during the event. Prior to the screening of the film, a discussion was held between Arthur Clarke and Harry Lange, where they discussed their experiences during the production of the film. 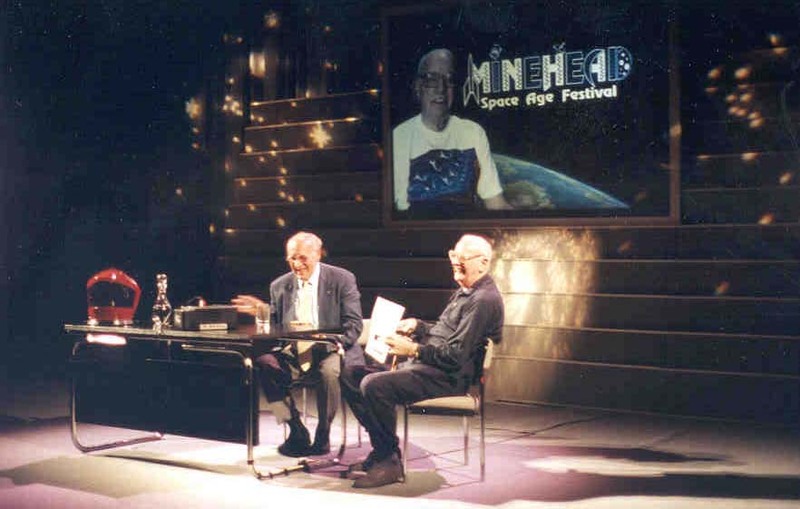 Harry Lange and Arthur Clarke share a funny story about making 2001.